Raid earned ₹ 0.02 Cr between day 50-56, Now Total Collection ₹ 103.07 Cr ! Raid earned ₹ 0.04 Cr between day 43-49, Now Total Collection ₹ 103.05 Cr ! Raid earned ₹ 0.08 Cr between day 36-42, Now Total Collection ₹ 103.01 Cr ! Raid earned ₹ 0.82 Cr between day 29-35, Now Total Collection ₹ 102.93 Cr ! Raid earned ₹ 0.57 Cr between day 25-28, Now Total Collection ₹ 102.11 Cr ! Raid earned ₹ 0.85 Cr on its 24th Day, Now Total Collection ₹ 101.54 Cr! Raid earned ₹ 0.55 Cr on its 23rd Day, Now Total Collection ₹ 100.69 Cr! Raid earned ₹ 0.43 Cr on its 22nd Day, Now Total Collection ₹ 100.14 Cr! Raid earned ₹ 0.58 Cr on its 21st Day, Now Total Collection ₹ 99.71 Cr! Raid earned ₹ 0.62 Cr on its 20th Day, Now Total Collection ₹ 99.13 Cr! Raid earned ₹ 0.68 Cr on its 19th Day, Now Total Collection ₹ 98.51 Cr! Raid earned ₹ 0.86 Cr on its 18th Day, Now Total Collection ₹ 97.83 Cr! Raid earned ₹ 2.78 Cr on its 17th Day, Now Total Collection ₹ 96.97 Cr! Raid earned ₹ 2.26 Cr on its 16th Day, Now Total Collection ₹ 94.19 Cr! Raid earned ₹ 1.82 Cr on its 15th Day, Now Total Collection ₹ 91.93 Cr! Raid earned ₹ 3.13 Cr on its 14th Day, Now Total Collection ₹ 90.11 Cr! Raid earned ₹ 2.62 Cr on its 13th Day, Now Total Collection ₹ 86.98 Cr! Raid earned ₹ 2.41 Cr on its 12th Day, Now Total Collection ₹ 84.36 Cr! Raid earned ₹ 2.42 Cr on its 11th Day, Now Total Collection ₹ 81.95 Cr! Raid earned ₹ 7.22 Cr on its 10th Day, Now Total Collection ₹ 79.53 Cr! Raid earned ₹ 5.71 Cr on its 9th Day, Now Total Collection ₹ 72.31 Cr! Raid earned ₹ 3.55 Cr on its 8th Day, Now Total Collection ₹ 66.6 Cr! Raid earned ₹ 4.66 Cr on its 7th Day, Now Total Collection ₹ 63.05 Cr! Raid earned ₹ 5.36 Cr on its 6th Day, Now Total Collection ₹ 58.39 Cr! Raid earned ₹ 5.76 Cr on its 5th Day, Now Total Collection ₹ 53.03 Cr! Raid earned ₹ 6.26 Cr on its 4th Day, Now Total Collection ₹ 47.27 Cr! Updated: Raid earned ₹ 17.11 Cr on its 3rd Day, Now Total Collection ₹ 41.01 Cr ! Raid earned ₹ 17.35 Cr on its 3rd Day, Now Total Collection ₹ 41.25 Cr! Raid earned ₹ 13.86 Cr on its 2nd Day, Now Total Collection ₹ 23.9 Cr! Updated: Raid earned ₹ 10.04 Cr on its 1st Day, Now Total Collection ₹ 10.04 Cr ! 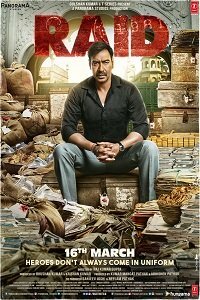 Raid earned ₹ 10.50 Cr on its 1st Day, Now Total Collection ₹ 10.5 Cr!